Surpassing expectations and comparisons to their former band, Sonic Syndicate, The Unguided's sophomore release is a strong follow up to their impressive debut. To the untrained eye, The Unguided are just an offshoot of Sonic Syndicate. This is an understandable comparison, since most of The Unguided's lineup was once part of Sonic Syndicate. Screaming vocalist Richard Sjunnesson founded The Unguided in 2010 after leaving Sonic Syndicate, while clean vocalist Roland Johansson and guitarist Roger Sjunnesson (also Richard's brother) departed Sonic Syndicate in 2009 and 2012, respectively. 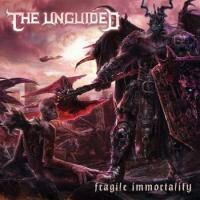 However, to those with keener eyes and ears, The Unguided is much more than just an offshoot. While Sonic Syndicate's 2010 album, We Rule the Night, was a critical and commercial failure that forced the band into a long hiatus, The Unguided's 2011 debut, Hell Frost, was a towering success that gave modern melodic death metal fans all that they wanted and more. On the follow up, Fragile Immortality, The Unguided truly show that they are not just the band that Sonic Syndicate should have become, but that they are the band that should have existed right from the start. Much of the growth that occurs on this album comes in the area of compositional diversity. Where Hell Frost had the same level of restrained urgency in its rhythm and tonality for most of the album, Fragile Immortality breaks things up a bit. Compositions range from the tastefully ambient ("Eye of the Thylacine" and "Enforce") to the domineeringly aggressive ("Defector DCXVI" and "Blodbad"), with a lot of ground covered in between. Heavy inclusion of synth effects and the obvious skills of the band's new drummer, Richard Schill, enhance the experience and set the tone for many songs. The whole album becomes more engaging as it ebbs and flows in a constant rhythmic dance. It may not seem like much, but it's a subtle touch that accentuates different parts of the album that would not otherwise be noticeable. Admittedly, The Unguided are not reinventing the wheel here. Modern melodic death metal was stylized very early by Sonic Syndicate and many other bands, and The Unguided are still within the boundaries of the genre. However, The Unguided have some of the best musical talent within the genre in their lineup, which is what makes them special. The twin-vocal attack of Johansson and Richard Sjunnesson -- the same one that helped make Sonic Syndicate as big as they were -- is key on Fragile Immortality, with a lot more trading off mid-verse and plenty of vocal duets that become highlights very quickly. Roger Sjunnesson provides the most reliable and evenly-timed rhythm guitar performance that can be found in the genre, while Johansson flourishes even more as the band's lead guitarist, a role that he did not have before joining The Unguided. Schill and bassist Henric Liljesand complete the sound with a monstrous rhythm core that refuses to take a back seat to the guitars. Churning bass and pounding drums are often the opening or closing tones heard on songs throughout the album, working to either set the tone for what's to come, or complete the audio picture that was just created. Despite the comparisons that they have received and will likely continue to receive, The Unguided have surpassed their former band in every way, truly coming into their own and creating their own identity. More than just a one shot project attempting to replicate former successes, The Unguided are their own venture, without limits or restrictions. Fragile Immortality shows that the band can perform outside of their expected style, creating a foundation for The Unguided to build on in the future. If anything, the album's name is somewhat inaccurate, because The Unguided are well on their way to securing a place in metal history that will be anything but fragile.